Here’s something nobody seems to warn you about when you embark on motherhood: those humongous horse pill prenatal vitamins you’re expected to swallow throughout pregnancy and while you’re nursing. You gag, you cough, slap your chest silly and still the darn thing is stuck in your throat. And when you do get it down, morning sickness kicks in, and you wonder what vital nutrient you might have missed out on today. Wouldn’t it be nice if some genius could figure out a way to fortify a yummy treat (preferably chocolate) you could just nibble on, chew, or sip to ensure you’re getting your share? Thankfully the women behind Bellybar by Nutrabella have. That’s why I’m sending all my expectant baby mama friends an adorable sampler of their bars, shakes, and chews that are brimming with folate, calcium, omega 3 fatty acids, and the vitamins essential for a healthy pregnancy. 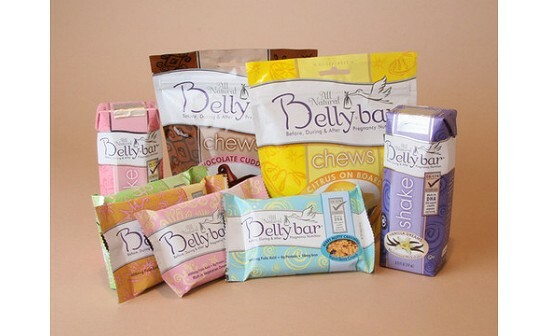 Despite the great nutrition, it’s all easy to swallow, because Bellybar products are honest-to-goodness food. The flavors and ingredients match common pregnancy cravings: rich chocolate, tart citrus, soothing vanilla. Another plus is that the bars and shakes have 180 calories or less, and the chews go for a mere 20 calories—ensuring that anyone who enjoys them remains a hot mama post pregnancy. How did you get the proper nutrients while expecting? Share your tips and tricks. Any tips to share with moms-to-be, Ladies? It's too bad Monica wasn't sending out these sampler packs when I was pregnant! I definitely had queasy days when these vitamin-packed treats would have come in handy. How about you? That precious photo you see next to this is of my great-niece, born on November 22! Isn't she perfect? I'm so happy for her mom and dad -- and you can be sure I'll be telling her mom about Nutrabella. We all know (as Nataly says in the video), that moms of wee ones need to eat on the run sometimes. Nutrabella tastes yummy and is a good food for those 'on the run' days! OK I hope he doesn't get embarrassed by this...but the last two times Jesse, who creates our videos, came in, he said "Can I have a Belly Bar?" Really. We have lots of other snack choices but he goes for the Belly Bar. So I guess they work for on-the-go dads too. Thank you Daily Grommet for the review of Bellybar products! And, thank you for all the great product insights for new moms and moms-to-be - there are so many helpful things to learn about, but so little time, and it's such a help to have your insights and recommendations. 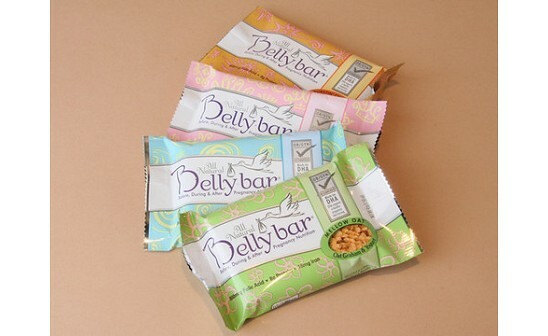 Bellybar products are designed to be nutritious - and delicious! I promise - no sacrificing taste with our snacks. In addition to delivering critical vitamins and minerals, all of our products are rich in vegetarian Omega-3 DHA, which helps with babies-to-be and newborns' brain development. And, mom's mood and memory - so double benefit! I LOVE the nutrabella products - they were great to get my vitamins before I got pregnant, the PERFECT, tatsty snack while I was pregnant AND when I was nursing!! I love the new chews - I have them at my office as everyday snacks! And the shakes are the perfect drink to go with the bars. My favorite bar flavor is the orange-chocolate - YUM! They're so tasty, my husband snacks on them too - really! Here’s something nobody seems to warn you about when you embark on motherhood: those humongous horse pill prenatal vitamins you’re expected to swallow throughout pregnancy and while you’re nursing. You gag, you cough, slap your chest silly and still the darn thing is stuck in your throat. And when you do get it down, morning sickness kicks in, and you wonder what vital nutrient you might have missed out on today. Wouldn’t it be nice if some genius could figure out a way to fortify a yummy treat (preferably chocolate) you could just nibble on, chew, or sip to ensure you’re getting your share? Thankfully the women behind Bellybar by Nutrabella have. That’s why I’m sending all my expectant baby mama friends an adorable sampler of their bars, shakes, and chews that are brimming with folate, calcium, omega 3 fatty acids, and the vitamins essential for a healthy pregnancy. 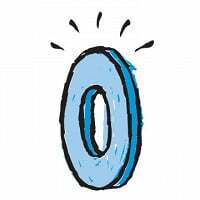 Despite the great nutrition, it’s all easy to swallow, because Bellybar products are honest-to-goodness food. The flavors and ingredients match common pregnancy cravings: rich chocolate, tart citrus, soothing vanilla. Another plus is that the bars and shakes have 180 calories or less, and the chews go for a mere 20 calories—ensuring that anyone who enjoys them remains a hot mama post pregnancy.